After you upgrade your SCSI adapter and record information about the scanner attached to your computer, you are ready to configure your scanner to communicate with Harmony. 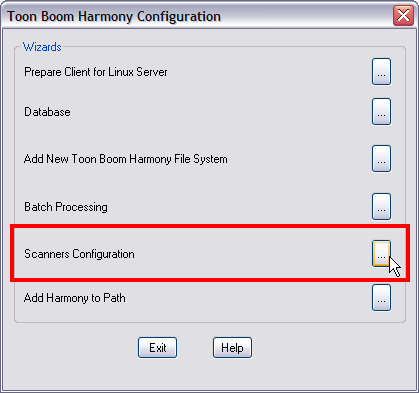 Use the Harmony Configuration Wizard to configure your scanner. ‣ From the Start menu, select All Programs > Toon Boom Harmony 10.3 > Tools > Configuration Wizard. The Harmony Configuration dialog box opens. 1. 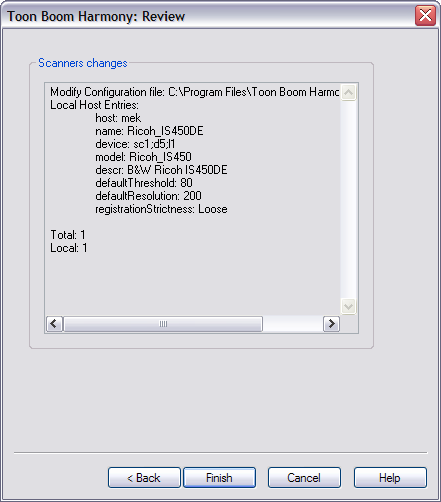 In the Harmony Configuration dialog box, click Scanners Configuration. The Scanner dialog box opens. 2. In the Name field, type or select the scanner's name. 3. In the Model field, select the scanner model. 4. In the Interface drop-down menu, select the scanner interface type. 5. 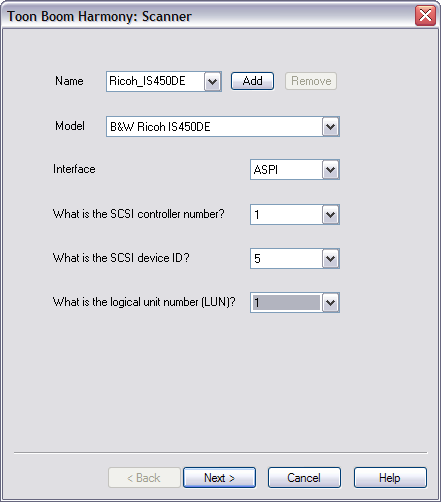 From the SCSI controller number drop-list, select the SCSI number that identifies your SCSI Adapter. 6. From the SCSI ID drop-list, select the SCSI number of the scanner. 7. From the Logical unit number (LUN) drop-list, select logical unit number. Due to a scanner's default configuration and the nature of the device, the LUN should always be zero. 8. After you've completed all the fields in this dialog box, click on the Add button. 9. Repeat the previous steps in this procedure for each scanner you want to add. To remove a scanner from your list, select the scanner from the Name field and click on the Remove button. 10. After you've added all your scanners, click on the Next button. The Review dialog box opens. 11. Read the summary of how you've configured your scanner and decide if you want to continue. • If the summary is accurate, click Finish to complete the configuration. • If you want to change something about the configuration, click Back until you reach the dialog box where you can change the option. After you make your changes, click Next until you reach the Review dialog box again. A confirmation message appears when the system updates your Scanner configuration file (Scan.conf).